In-form Glamorgan registered their fourth successive Championship victory as they beat Leicestershire by 137 runs on the final day at the Swalec Stadium. The Welsh county began the day as favourites, with the visitors on 75-3, chasing a target of 324. The only prolonged resistance came from Matthew Boyce (60) and Niall O'Brien, who added 54 for the sixth wicket. 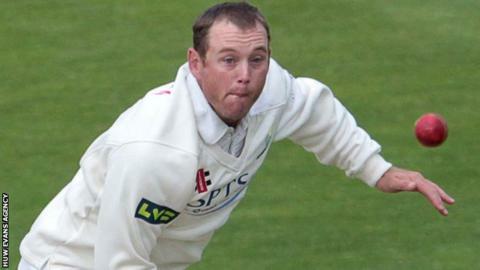 Andy Carter removed O'Brien (41) and Charlie Shreck in the same over as Leicestershire were all out for 186. The fine performance from the hosts, which saw the wickets shared among six different bowlers, gave them their fourth Championship win in a row for the first time since 2004. When Glamorgan last won four Championship games in a row 11 years ago, their victims in the fourth game were Leicestershire, who were beaten in Cardiff by a far wider margin of 409 runs. Matthew Maynard, Jonathan Hughes and Robert Croft all scored centuries for the Welsh county in that game, and Mark Wallace is the only Glamorgan player to appear then and in the last win over the Foxes. Still unbeaten, they remain third in Division Two and have closed to within 11 points of second-placed Surrey, with a game in hand. Leicestershire suffered a setback in the second over of play when nightwatchman Jigar Naik was bowled by Andrew Salter. Occasional leg-spinner Colin Ingram made the key breakthrough when he ended Boyce's 148-ball innings by having him caught at short leg by Chris Cooke. The visitors were 158-7 at lunch, but Craig Meschede (2-29) bowled Ben Raine, and Carter finished the job in his first over of the day, having O'Brien caught behind as he flashed at a wide one and then trapping last man Shreck lbw. "Looking back over the four days it was another good win for us in the way we played our cricket. "We had our backs against the wall at certain stages in the game and we managed to fight our way out of it. "We're not relying on one or two people to get us over the line, everybody's been chipping in and the attitudes have been spot-on. "I think it's very important when you get on a run like this to stick to the basics and stick to what we've been doing."